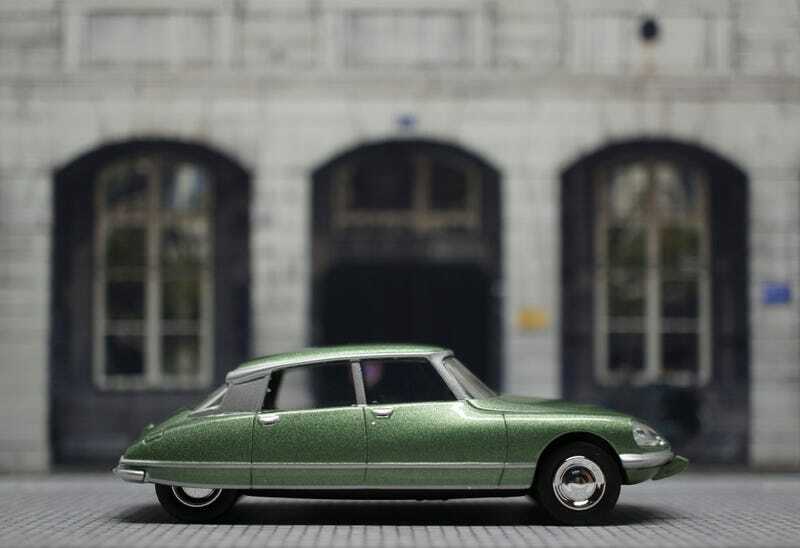 It had a little cameo last week, this Citroën DS23. Last week’s was the DS19, this one has the bigger engine and the bigger headlights. As in 1967, with the 2nd nose redesign, it’s light clusters grew significantly. Thanks to that growth there were two lights in the clusters, the inner ones turn with the movement of the steering wheel. Directional headlights. In 1967! And was the DS with the old headlights already futuristic, with those new ones it was like a spaceship. At least, to me. It always had the form of a pike, that’s why in my country they’re called after those carnivorous fish. A “Snoek”. But I’m sure all of you already know quite some of the history of Citroën’s probably best known model. I know I’ve shown a few but I’m really glad Norev came with the redesigned nose after all kinds of different DS19s they did in 3". So be sure to get one of these as they’re really worth the while. And that’s it for today actually, I’m glad someone already opened French Friday today so I can take a rest and enjoy my weekend. Bon Week-End to you all as well! Now that’s for the weekend!